Antonino De Rosa is a name many know and love, but newer players might not know the man well enough. De Rosa used to dominate the game, with his jovial boisterous personality, and his razor-sharp play. Not only does he have 11 Grand Prix Top 8s (including 4 wins) spanning over a decade, but also a Pro Tour Top 8 in Prague and a Nationals Top 8 to boot. After qualifying, he immediately joined The Pantheon, and started testing with the best in the world. You can read about his journey back to the game in Corbin Hosler's The Old Pro, The Rookie, The Grinder. "I haven't been in a feature match in like a decade. Man, under these lights..." De Rosa trailed off. "It's bright!" "And now you made me look up," Jon Stern said now squinting and rubbing his eyes. The two laughed. 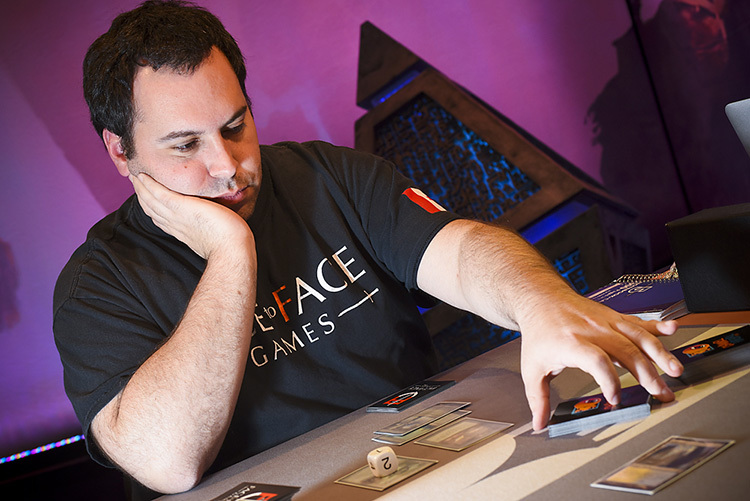 Jon Stern is jokingly called the "Grandfather of Canadian Magic" by a particularly trolling team partner, eleventh-ranked Alex Hayne. But there's more truth to than just an old-age joke. Stern was the name that transitioned Canadian Magic from the old school to the new school. He has five Grand Prix Top 8s, including two wins, all since 2012. He grew up with the last generation, and how he's helping herd the new generation. The ChannelFireball and Face-to-Face Games testing team has been playing the new fangled colorless Eldrazi build, but that ol' salt Stern was sticking with Affinity. As the two talked, De Rosa tried to extract as much deck information as he could. "So did you guys do well in the last round too?" "Yeah, we've been doing great so far." "You were right; you broke the format," De Rosa paused. Nothing from Stern other than a nod. If De Rosa knew Stern was on Affinity, he would be rather pleased. Decks like Affinity were the reason he chose his interactive Jeskai deck over the infect deck that much of the rest of Pantheon is playing. But without the information he was hoping for, De Rosa shook Stern's hand, wished him good luck and drew for the game. Jon Stern went first and opened with an Ornithopter and Vault Skirge off Blinkmoth Nexus. The next turn brought along a second Skirge and a Memnite. Stern had brought the little guys, now all he needed was the power. He had it all in his hand—two Steel Overseer, an Arcbound Ravager and a Galvanic Blast—but had yet to draw his second land. "And here I thought you were playing Eldrazi," De Rosa said. Most of Stern's whole team was on the pure-colorless Eldrazi deck, and now three rounds into Modern, that fact had rumbled through the room. Old school pro Antonino De Rosa made his way back on the Pro Tour via Regional Pro Tour Qualifier. "I'm one of the last holdouts," Stern said defiantly. Honestly though, Stern had also been duped. He had thought De Rosa was on Affinity (one of the decks that brought him the most success) and had kept a great hand for the mirror, but a subpar hand in other matchups. De Rosa walled himself up with two Wall of Omens and tried to settle in for the long game. Stern may have vomited creatures on the board, but none of them were particularly large. And in two turns, while still at 13 life, De Rosa killed off everything slightly threatening. With an Electrolyze and a Lightning Bolt, De Rosa took out both Vault Skirge and the Steel Overseer Stern cast after finding his second land. This left Stern with two Ornithopter and a Memnite—innocuous, especially with the two 0/4s on the other side of the field. De Rosa was sitting at a full seven cards in hand. With two missed land drops from Stern, the game had stalled and turned a corner for De Rosa. He was completely unthreatened and still at a double-digit life total. At the end of Stern's turn, De Rosa cast a Restoration Angel and flickered his Wall of Omens to draw a card. After drawing for the turn he wasn't sure if the coast was clear, but he slammed down the Kiki-Jiki, Mirror Breaker. Stern did not have any instant-speed creature removal, and so De Rosa used two alternate parts of the now-defunct "Splinter-Twin" combo and made a "Resto-Breaker" combo instead. The Mirror Breaker tapped to make a copy of Restoration Angel, which would flicker the Kiki-Jiki and untap it, enabling it to create another copy. Repeat thirty times, and you've got a lot of Angels. We were on to the second game. "Gotta take out my notes!" De Rosa said, riffling for his sideboard notes. "There are so many decks in Modern, how am I supposed to remember all this stuff?!" He glanced at the sheet. "Thankfully, I'll let my smarter teammates work it out for me." "Four Shatterstorm, four Stony Silence ..." De Rosa joked. This man came from the old-school East Coast Psych School. They taught that the more overt and outward you are, the easier it was to get your opponent off their game. De Rosa wasn't actually siding in all those cards... was he? 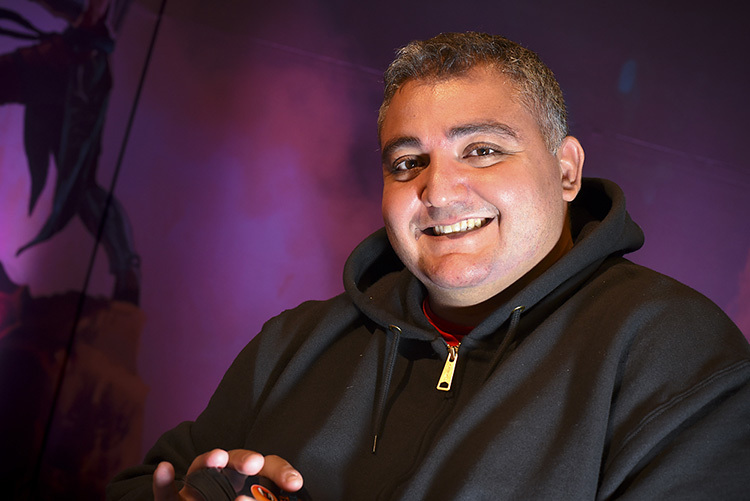 Jon Stern has led the way for the modern Canadian Magic era. For this tournament, he deviated from the team's majority choice. "Yeah I played a lot of Affinity in my day. But in my day, I played with cards that actually said 'Affinity' on them. Myr Enforcer, Frogmite. I don't know if I'm down with this new style." The two finished shuffling and ready for another go. In the second game, Stern had a decent start with an Ornithopter and an Arcbound Ravager. It was good to get the party going, but De Rosa's start was infinitely more impactful. The Italian-American had a turn-two Stony Silence. Stern grimaced. He grimaced again. "I'm going to respond to that." The Canadian thought for a minute, then sacrificed his Darksteel Citadel and Ornithopter to the Ravager, making it a 3/3. But De Rosa wasn't finished yet. On his next turn, De Rosa cast a Lightning Bolt on the Ravager. Stern responded by activating his final permanent, a Blinkmoth Nexus, and attempted to use the modular ability to make his land a 4/4. De Rosa used his Path to Exile and took that out as well. "I probably should have just used the Path [on the Ravager], but I wanted that Blinkmoth too," De Rosa said of his slightly greedy play. However, it worked out for him, and he left Stern with a lonely Mountain. At this point, De Rosa was at 11 life, and had a Wall of Omens and Celestial Colonnade. There were very few conceivable outs from this position for Stern—probably just 12 damage worth of burn. This was a match of misinformation. If De Rosa knew Stern was on Affinity, rather than Eldrazi, he would have shipped back his Game 1 hand. And the same went for Stern. That slight misinformation set up a Game 1 that played out completely differently than the match-up usually would. Modern's a crazy world.